Tall fescue is a wide-bladed, spike-tipped grass that many consider a weed in the home lawn. 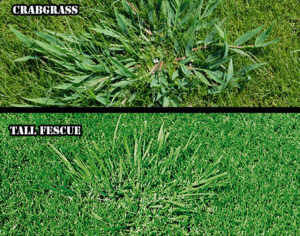 A perennial grass (lives year to year), it is often mis-identified as annual crabgrass. It appears in clumps that may grow more rapidly, and at times taller, than the surrounding turf grass only a few days after mowing. The clumps of tall fescuemay show initial green up earlier in the spring than the surrounding bluegrass lawn. 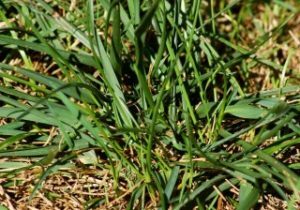 Considered unsightly in the finer textured bluegrass turf, this hardy perennial can be considered a troublesome weed.Better management practices include digging up the plants, being cautious to remove all the roots – otherwise the grass will reappear. Or, applying a non-selective herbicide to the foliage to kill off the plants. Caution: be sure to read the label – any non-selective herbicide off target or beyond the fescue grass will kill surrounding bluegrass. Repeat application may be necessary, to be sure all tall fescue has been controlled, prior to reseeding or resodding the area.